Increase email click-through-rates by as much as 200 to 300 percent. Boost users’ average time on site by 88 percent. Grow your revenue 49 percent faster than other content types. Bring in two to three times more visitors each month. You’re probably thinking, “I’d like in on that!” Well, the good news is this “magical” content type actually exists, in the form of video marketing. I’m not here to convince you that you need video marketing (although those stats above certainly help). 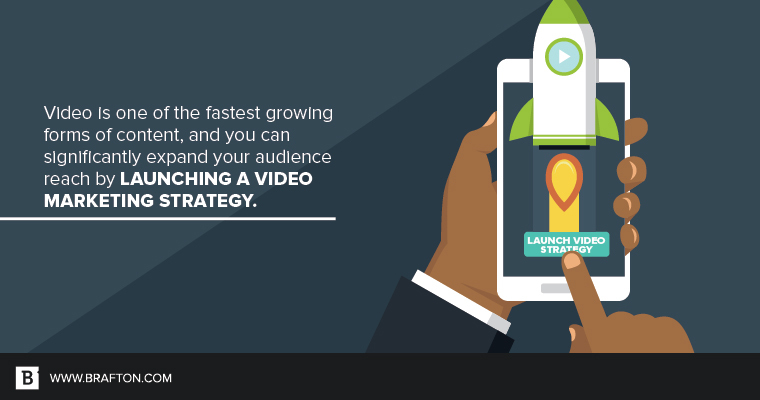 Chances are you already know why you need video, and you want to focus on how to do it. We’ve got you covered. With help from Senior Creative Director Perry Leenhouts and Account Director Sonny Sharp, check out the steps below to begin a video strategy that sets you on the path to success. Remember how your parents always told you to wait 30 minutes after eating before going swimming? Well, we’re not sure how practical that advice really was (thanks, Dad! ), but you should apply that line of thinking to your video strategy. If you’re jumping in headfirst by going around shooting videos willy-nilly style, chances are you’re going to flounder. Take a step back and come up with a plan for your strategy. What do you want your videos to accomplish? What kind of ROI are you looking for? What type of video will best get the message across and resonate most with your audience? What story, aspect or message do you want to focus on first? Once you’ve answered these questions, you can move on to determining what kind of video you want to produce. You may already have a video in mind based on what you want to accomplish, whether it’s traffic increases, more social followers, or the move prospects from the middle of the funnel to the bottom. Whatever direction you go, just make sure you’re making a video based on data and research, not on a hunch. Take a look at high-performing blog posts, and create a video based on the topic. You can do the same with other forms of content, such as whitepapers, eBooks or infographics. Again, it’s got to be all about the data. If you’re making a video just for the sake of making a video, your strategy will be misguided from the start. Additionally, as Sonny explained, during this stage you need to formalize your full video strategy. Look at your immediate and long-term goals, then map out a full, comprehensive strategy that provides video throughout the entire sales funnel. You don’t have to shoot all the videos now, but at least you have a strong blueprint of where to go next. Before you pick up that camera, you’ve got to prepare for your first video. Not only do you have to schedule shoots with any individuals who will be featured, but you’ve got to write a script, scope out a location and make sure everything is lined up. During this stage, when you’re deciding which message you want to get across in your video, you’ve got to focus on storytelling. Sonny added that videos that tell a story also help humanize your business, and this goes a long way toward building trust. When you’re preparing your video, be sure you’re not ignoring the storytelling element while you’re hammering out the rest of the nitty-gritty details. Now comes the fun part! If you’re just starting out in video, you don’t need to rent a fancy camera or hire an outside agency to do all the work for you – just shooting a short intro video on an iPhone can get the job done. Whatever type of video you’re shooting, whether it’s produced internally or externally, Sonny added that you should make sure it can be leveraged on all your marketing channels. For example, if you’re producing a corporate promo, use the whole thing or just viral snippets to use in email and social media. He stressed that every video strategy should have a multi-channel approach. Perry said you need to make use of all the tools you have at your disposal to make your video as effective as possible. Once you’ve made your video, take a look at it and ask yourself: Does this video properly represent my company brand? If you can answer yes to that question, you are on the right track. Just like with any part of a content strategy, if you aren’t tracking your metrics and return on investment, you’re doing it wrong. Think back to the first step above: What are the goals you want to accomplish with video? What kind of ROI are you looking for? Chances are, video is going to help you meet those benchmarks, but you’ve got to measure your results and be willing to make changes based on them. The subject of video marketing may seem overwhelming for some marketers, but by starting with a solid plan, an easy-to-digest video, and the willingness to revise your strategy based on your prospects’ preferences, you can be well on your way to video success.